We use the Alpha Anywhere software development platform to create our asbestos software system, Alpha Tracker. 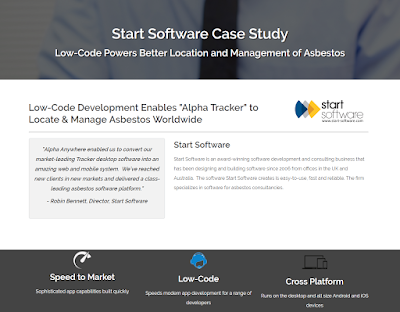 Our partners at Alpha Software have recently posted a detailed case study about Alpha Tracker and how their platform has enabled us to build the market-leading asbestos software system for asbestos professionals in New Zealand, Australia & the UK. Click this link to read the case study on their website.